2018 has been a pretty rough year so far for Facebook. While the tech Goliath has faced privacy concerns in previous years, both 2017 and 2018 broke news that has fundamentally altered the public’s trust of the platform. In addition, the revelation that Russian-based advertising and fake news may have impacted the 2016 U.S. Elections has wounded the prospect of successful digital advertising & marketing through trusted channels. The bad press for Facebook culminated in Mark Zuckerberg making a high-profile visit to Capitol Hill in April to testify on Facebook, its privacy issues, and its data use policies to both the House and Senate. In addition, in the month of April, Facebook announced a number of changes to its API and third-party vendor integration. These changes have all been announced in the spirit of creating an environment where users of Facebook feel they can better trust their feeds, and will enrich the value of posts that are made to the platform. Users will no longer be able to schedule content to post to their personal Facebook profiles from third-party applications. Since Clearview Social is a third-party application, this change will impact how you use Facebook as a platform to strengthen your brand. Facebook intends to direct the user’s profile toward driving meaningful interaction & conversation. To that end, users must directly interact with Facebook to share links. This increases the likelihood that more content posted to a profile will be trusted. The Clearview Social features affected by this change are PeakTime™ and Share All, which will no longer be able to post to personal Facebook profiles after August 1, 2018. While Facebook is removing its API to publish content to your personal profile, there are two APIs that vendors may still use for publishing—Facebook Pages and Groups. We see this move as a net positive for Clearview Social, as many of our users have asked to be able to publish to both Groups and Pages. 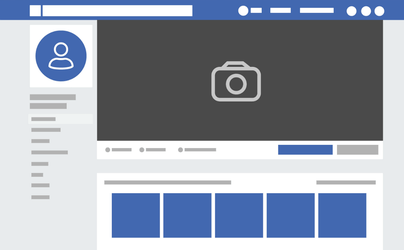 Facebook Pages are currently supported through Company Posting, and this will remain the default way to post to Facebook through a Company Account. In addition to Company Accounts, we are happy to announce that starting in August, we will make Facebook Pages and Groups available for all our users to select when connecting their Facebook accounts. You will be able to select one Facebook Page or Group as the target for your scheduled shares. This practice is actually what Facebook has recommended for quite some time, and now Clearview Social will function in a way that works with Facebook’s own API’s and best practices. In addition to Facebook Pages & Groups, we plan to continue allowing users the ability to share content directly to Facebook personal profiles from Clearview Social using Facebook’s Sharing on the Web interface. This means you can still Share Immediately to Facebook, and you will be able to track results on those shares in Clearview Social! Right now about 8% of our total connected accounts are connected to Facebook, and shares to Facebook make up about 6% of our total shared content. We’d love to see these numbers increase, and we believe connecting your Clearview Social account to a Facebook page or Group is the right strategy for using Facebook. After August 1st, if you are currently connected to Facebook, you may still post content directly using our soon-to-be-released integration with Sharing on the Web. If you want access to your Pages & Groups, you will need to go to your Settings page, then disconnect & reconnect Facebook to grant the required permissions. When you reconnect your account, you may then select a target Page or Group for your shares.